Cumberland School of Law is one of only a few law schools where law students run intramural advocacy competitions. Cumberland School of Law is one of only a few law schools where law students run intramural advocacy competitions. The trial advocacy board and the Henry Upson Sims Moot Court Board oversee the student-run intramural competitions. The board members are Cumberland School of Law students. The trial board is led by a student chief judge and the moot court board is led by a student chief justice. Each board also has student executive officers and members. The executive officers are responsible for scheduling, recruiting judges, problem selection and distribution, rules and score tabulation. All members of the board judge the preliminary rounds of the competitions. The final rounds are judged by local attorneys and judges. 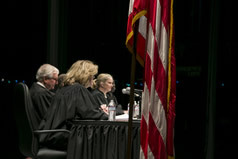 The winners of the competitions are eligible to represent Cumberland School of Law in national trial, appellate and alternative dispute competitions. The Cumberland Trial Advocacy Board is dedicated to educating and training law students to become competent, aggressive and ethical trial attorneys. Cumberland School of Law’s clinical program is nationally recognized. The trial board sponsors mock trial competitions each semester in which students compete in various mock trials that resemble real federal trials judged by experienced student advocates, attorneys, and judges. The trial board encourages freshmen to participate as witnesses during their first semester and in the freshman competition the second semester. In addition, the board sponsors negotiation, mediation and client counseling competitions. Two-person teams present preliminary motions, opening statements, direct and cross-examination of witnesses and closing arguments in trial and arbitration competitions. Teams interview mock clients and are judged on their ability to communicate, elicit facts, advise and recommend appropriate actions in client counseling competitions. Teams are judged on how they use an effective combination of advocacy skills and problem-solving abilities in negotiation and mediation representation competitions. Participants learn about each other’s interests, brainstorm options and select and shape a solution that meets their interests. The Henry Upson Sims Moot Court Board has actively participated in national moot court competitions, winning high national and regional honors in these events. The board is composed of junior and senior students who have demonstrated excellence in both their writing and appellate advocacy skills. New members are selected each fall and spring based on the applicant’s appellate experience, writing skills and G.P.A. The moot court competitions resemble appellate arguments with each side arguing for their client in front of three appellate judges. The moot court competitions are a great way to enhance legal arguing skills. Moot court competitions simulate actual appellate arguments, which consist of written briefs and oral arguments given in front of a panel of judges. The Albert P. Brewer Client Counseling Competition is named for current law professor and former Alabama Governor Albert P. Brewer. The competition simulates a law office consultation in which law students, acting as attorneys, are presented with a client matter. They conduct an interview with a person playing the role of the client and then explain how they would proceed further in the hypothetical situation. The trial advocacy board provides students with the opportunity to compete in an arbitration competition during each semester. Essentially, arbitration is a trial around a conference table. In competition, law students will act as attorneys in an arbitration setting. The competition measures how well law students prepare and present an arbitration case, including opening statements, witness examinations, exhibit introductions, evidentiary presentations and summations. The national arbitration team is selected from the intramural competition. The national team includes the competitors who will best represent Cumberland School of Law in regional and national competitions sponsored by the American Bar Association’s Section of Dispute Resolution. The Saad Appellate Advocacy Competition is a Cumberland School of Law student-run intramural competition held in the fall of each school year. Participants receive the record of a fictional case that is on appeal and write the argument portion of one issue as either the petitioner or respondent. Students then argue that issue in front of practicing attorneys and judges, who act as appellate court justices. As students advance, they argue different issues and positions. In 2012, 35 students participated in the four-round competition, which also served as tryouts for the law school’s national appellate advocacy team. The winner of Saad is awarded a spot on the national team. The competition is named in honor of Professor Henry C. Strickland who joined the Cumberland School of Law faculty in 1988. He regularly teaches courses on alternative dispute resolution, civil procedure, and conflict of laws. Also, he has taught courses on constitutional law and remedies. His primary research interests include arbitration law, constitutional law and legal education, and he continues to write and speak on those topics. Strickland served as the law school’s associate dean for academic affairs from 2001 to 2011. The negotiation competition is held in a traditional format with several judges and two to four competitors per room. Participating students act as attorneys on behalf of their clients during the negotiation rounds. The competitors are given a new problem each round. The executive board members of Cumberland School of Law’s Trial Advocacy Board judge the competition using strict criteria provided in the national negotiation competition rules. The negotiation competition is held several times throughout the year. In the fall semester, the students participating in the negotiation competition compete for a spot on the national negotiation team. The coaches monitor the competition and make their decisions based on each student’s performance. The competitions consist of three to five rounds, depending on the number of competitors. The Herbert W. Peterson National Trial Team Competition or The Peterson as it’s referred to in the halls of the law school serves as the proverbial battleground for some of Cumberland School of Law’s strongest future-litigators to compete for a spot on one of the nation’s top trial teams. This student-run intramural competition is done in a traditional judge and jury format, similar to the Haley and Williams Trial Competitions, but with a few unique qualities. First and foremost, advocating in The Peterson brings you more than just the sense of accomplishment from a trial well done. The Peterson is the application process to be a member of the law school’s nationally ranked trial team. The Peterson takes place during the first few weeks of each fall semester. Every competitor advocates in two rounds before the advancement round. The Peterson is also unique in that the competitors are randomly assigned their responsibilities for each round, as well as which witness they will direct and cross-examine ands who their partner will be for each round. Lastly, The Peterson is unique because all the judges of this competition are active litigators in the Alabama Bar. This competition is named for Janie L. Shores, the first female justice to serve on the Supreme Court of Alabama who became the first full-time female law faculty member in Alabama when she joined Cumberland School of Law in 1965. This competition is held in the spring and focuses on sharpening the appellate advocacy skills of second- and third-year law students. In the Shores competition, participants compete in pairs. They write the argument portion of a brief and argue those issues in front of practicing lawyers and judges who act as appellate court justices. As teams advance, they argue the opposing side of their issues. The mediation competition provides law students the opportunity to role-play as advocates and clients in a mediation setting. The competition encourages students to model appropriate preparation for and representation of a client in mediation. Each team consists of two students. In each round of the competition, one student plays the role of an attorney and the other plays the role of the client. This competition is named in honor of Parham Williams who was dean of Cumberland School of Law from 1985 to 1996. The Williams Trial Competition is only for first-year law students and is the first opportunity for students to participate in a trial competition. It is held during the second semester of the first year of law school in a traditional judge and jury format.